The English Defence League marched over Tower Bridge to the edge of Tower Hamlets on Saturday accompanied by a heavy police presence. Around 600 EDL supporters walked from the base of the bridge to a rally point outside Aldgate East Station, whilst a few hundred meters down Whitechapel Road, a large counter demonstration amassed in Altab Ali park. A number of local community groups, councillors, national organisations and trade unions, along with representatives from different faith groups were present at the anti-EDL rally. Over ten lines of police and police van barricades separated the two groups, with the Metropolitan Police saying 3000 officers were on hand. Some anti-fascist demonstrators did attempt to break police lines and reach the EDL during the afternoon, with arrests being made. A small splinter group tried to head off EDL supporters as they made their way over Tower Bridge, but police prevented them from doing so. The EDL had wanted to march through the centre of Tower Hamlets to Altab Ali park, which is named after an Asian man who was murdered in a racist attack in 1978. The Met however said earlier this week that far right group would not be allowed to go further than the edge of the borough, calling the route “unnecessarily provocative”. 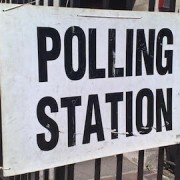 The EDL had challenged the ruling on Friday, but it was upheld by a judge. 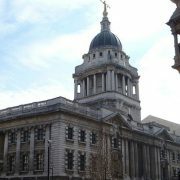 An EDL lawyer said that the group wanted to protest against Tower Hamlets being “subject to Sharia law”. The borough has one of the largest Muslim population in the country. Following the EDL rally outside Aldgate East Station, the march turned around and went back over Tower Bridge to the original muster point. Other than crossing the path of a small number of anti-fascist demonstrators, who were quickly pulled away by police, it ended with little disturbance. 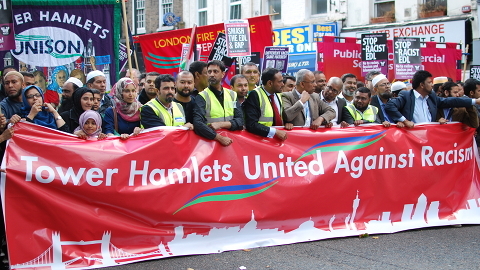 The Mayor of Tower Hamlets, Lutfur Rahman, who had launched a legal challenge against the Met’s decision not to ban the EDL from marching, spoke to the counter demonstration as the EDL’s rally ended. “EDL you have failed. Fascists are not welcome here”, he said, and also thanked police for preventing the EDL from moving through the centre of the borough. After the counter demonstrators heard news that the EDL had passed out of Tower Hamlets, a short “victory march” was carried out along Whitechapel Road to the East London Mosque. For a full recap of the day’s events head to the ELL Twitter feed. The EDL’s leader Tommy Robinson was later arrested for entering central Tower Hamlets in violation of the conditions of the march. He was charged under his real name Stephen Yaxley-Lennon, was bailed and will appear in court on 22 October. Police have said 300 arrests were made on the day, with the majority made when the anti-facist splinter groups, including Black Bloc members, attempted to reach the EDL march. The counter demonstrators estimated that up to 4,00o people joined in their protests. A Scotland Yard spokesman said: “Fourteen arrests were made for a variety of offences including violent disorder and criminal damage. As a one time resident of Tower Hamlets I keep and eye on what is going on and I couldn’t be surprised by the numbers claimed by the organisers of the counter demo and what you have here. They are saying seven thousand and yourselves one thousand. Clearly something is wrong, can anyone enlighten us? No mention of the arrest of 286 anti-fascists? Poor reporting. – The post has now been amended to include details of the arrests – Terry Kirby, managing editor.